(Left to Right): OCERS Board members Chris Prevatt, Russell Baldwin and Frank Eley are watching out for your retirement security at the Jan. 16, 2019 Board Meeting. Making sure that your pension is there for you when you leave public service is my top priory. My colleagues on the OCERS Board—Russell Baldwin and Frank Eley—feel the same way. Russell also serves with me on the OCEA Board of Directors and Frank Eley is a former OCEA president now retired from County service. Last October, you demonstrated your faith and trust when you resoundingly reelected me to the OCERS Board. I want to thank you for your confidence. OCERS has 27,000 active and deferred members and provides benefits to approximately 17,000 retirees, beneficiaries and survivors. $750 million in pension benefits were paid out in 2017. Keeping an eye on investment polices and providing guidance to OCERS staff requires a keen eye for detail, tough questions and the ability to make decisions that benefit ALL OCERS members. You would think offering retirement security after years spent serving the public would be something to be proud of. Unfortunately, there are threats to what are called “defined benefit plans” which are what OCERS offers. Wall Street analysts and Labor’s political opponents routinely attack defined benefit plans with the goal of switching them over to 401Ks offered by those same Wall Street brokers. A state initiative to do just that was shelved in 2016 after facing intense opposition from Labor and its political allies. Sometimes, attacks on defined benefit plans begin right here in Orange County. That’s why it’s so important to have representatives on the OCERS Board who are there for you. The agenda for the January 16 meeting featured a report on innovations large and small that improve how OCERS serves you. These include new ways to secure member personal data when electronically communicating with banks, a new communications policy for Board members and OCERS staff, and new procedures for reviewing disability claims. Congratulations to OCEA member Teresa Panameno on being named OCERS Employee of the Year! It is critical that we maintain our focus on protecting your pensions. That’s why OCEA General Counsel Don Drozd attended the meeting with OCEA Board members Adele Tagaloa and Liza Cooper Butler. Adele and Liza provide additional OCEA member support to our retirement security. 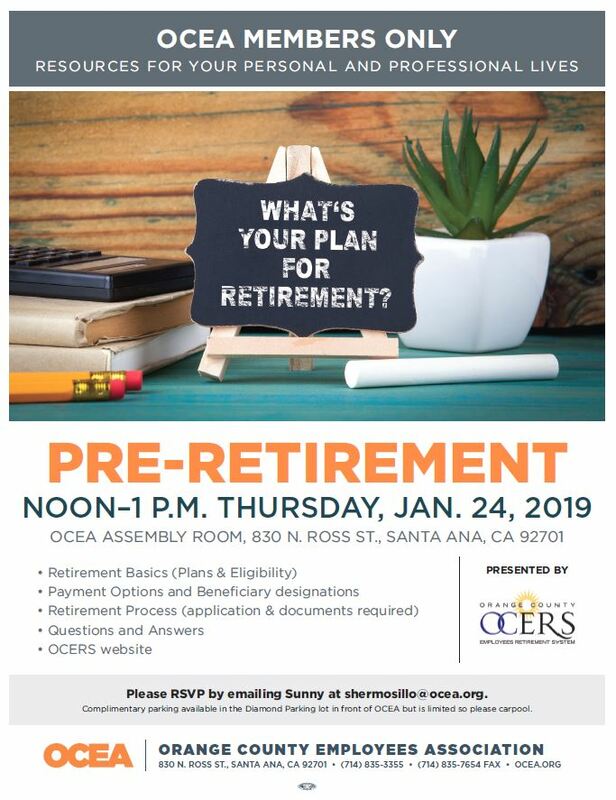 Next week, OCEA is a hosting a “members only” pre-retirement seminar presented by OCERS. You can learn the retirement basics, payment options and talk to the experts. Lunch is provided. The seminar is from Noon – 1 p.m. Thursday, Jan. 24, 2019. Check out the flyer below for more information. Retirement security doesn’t just happen. Working people have to stand together to defend the benefits our families deserve. We will keep you updated on any new developments at OCERS that impact your pension and your future.